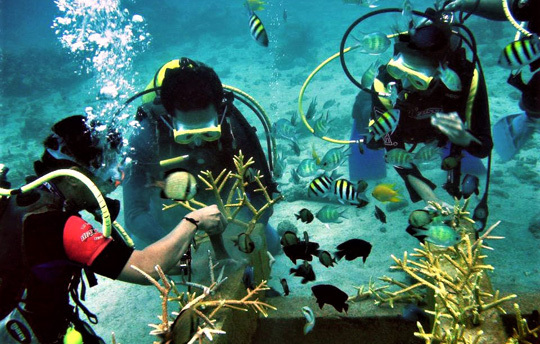 Divers doing coral reef transplant at Duka Bay in Medina, Misamis Oriental. A partnership with the Metro Pacific Investments Foundation, the Municipality of Medina has been reaping the benefits of the Marine Protection, Inspection and Conservation (MPIC) which has helped restore the balance of the area’s marine ecosystem. Incepted in January 2018, the project trained and deputized 27 volunteers who later became the MPIC Guardians who were instrumental in the enforcement of fisheries-related ordinances. Municipal mayor Donato Chan said the local government has been implementing monthly cleanups in all coastal barangays, and conducting seaborne and foot patrols to enforce ordinances against illegal fishing which include the prohibition of non-residents from fishing in municipal waters and the use only of hook and line fishing at the fish aggregate device. The town chief executive noted that the program has made a positive economic and social impact on the community, evident in the increase of daily catch of fishermen of up to 8-10 kilograms. The community undertaking has also given birth to the operation of 16 tourist boats which has provided alternative livelihood to villagers in Barangay Duka. Medina LGU and the foundation will jointly enhance the MPIC Guardians’ equipment and tools and upgrade their skills in first aid, rescue, and scuba diving. They will also undergo a study tour to Del Carmen town in Siargao to benchmark on mangrove protection and propagation, eco-tourism, and homestay services for visitors. As part of its sustainability efforts, other components will be put in place, such as the establishment of livelihood programs for women’s organizations, and capacity-building related to eco-tourism. 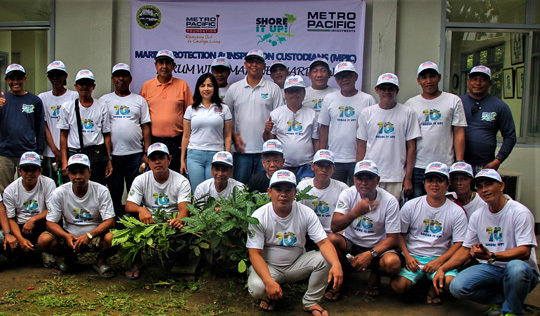 The MPIC Guardians is part of the Shore It Up, the award-winning corporate social responsibility program of the Metro Pacific conglomerate, which has been held in key coastal areas in partnership with local government units and community stakeholders. MPIC Guardians with Metro Pacific Investments Foundation president Melody Del Rosario during the recent sustainability forum in Medina. For the past 10 years, it has gathered over 85,000 volunteers from the Metro Pacific firms, national government agencies, local government units, law enforcement agencies, civil society groups, dive industry stakeholders, and schools. A good number of these volunteers are recruited in the Junior Environmental Scouts, an environmental education initiative for grade school children. Topics: Medina , Misamis Oriental , Metro Pacific Investments Foundation , "Marine Protection , Inspection and Conservation"